Gold glittered intenselyduring the final quarter of 2018 as persistent trade tensions, explosively volatile equity markets and fears of plateauing global growth sent investors sprinting to safety. With none of these themes showing signs of letting up, there are plenty of reasons to expect Gold to continue its revival into 2019. Themes that can support Gold this year include heightened political uncertainty in France, Italy’s budget drama and the ongoing Brexit turmoil of uncertainty. All of these circumstances provide just a few reasons to remain supportive on the yellow metal’s appeal as a safe-haven. When you then factor into the equation anxiety over the ongoing market turmoil and also fears the global economy is expected to enter a downturn, signals are clear that bulls are ready in the vicinity to purchase the precious metal. As we enter Q1 of 2019, the outlook for Gold will be heavily influenced by geopolitics, U.S. rate hike speculation and equally as important, the Dollar’s trajectory. 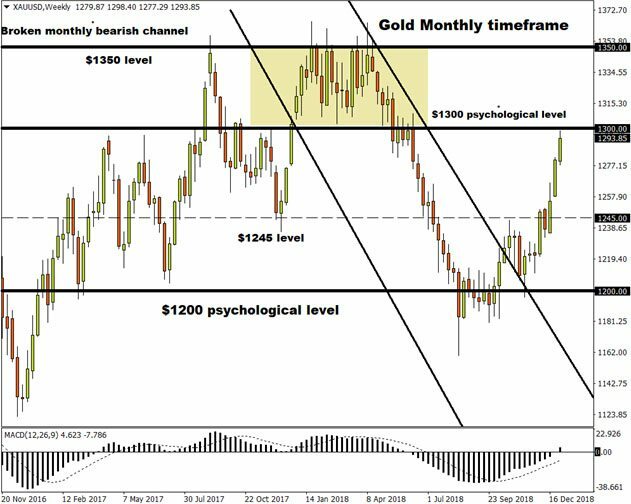 Rising geopolitical tensions across the globe are likely to fuel risk aversion and accelerate the flight to safety – ultimately elevating Gold prices higher. Persistent U.S.-China trade tensions coupled with severely depressed stock markets remain major factors that will positively impact Gold’s outlook. Macroeconomic conditions in emerging market markets will be another important factor when determining Gold’s direction. Emerging markets have been treated without mercy by the unfavorable market conditions with geopolitical risks draining investor confidence. Physical demand for the yellow metal could take a hit if growth in emerging markets decelerates sharply this year. On the bright side, possible Dollar weakness will be a welcome development for EM currencies as it boosts consumer purchasing power for Gold. While Gold’s near-term outlook hangs on the Dollar’s performance, the longer-term direction will be determined by the U.S.-China trade tensions, Federal Reserve, health of the global economy and developments across emerging markets. If global market conditions fail to improve and risk aversion reigns, Gold is in line to be one of the very few instruments that shines through in 2019. 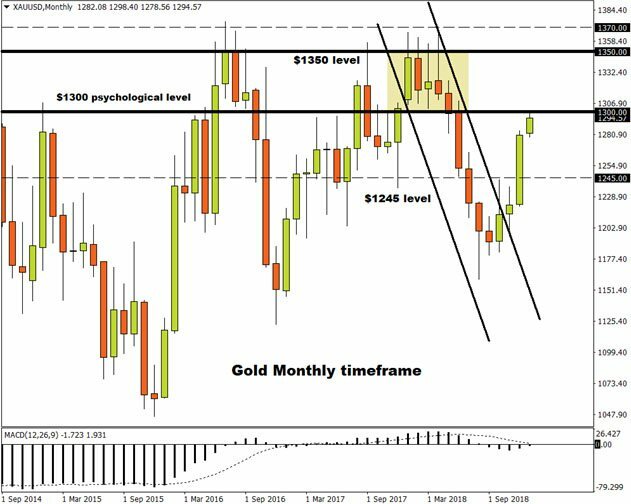 Focusing the technical outlook, Gold is firmly bullish on the monthly timeframe with prices trading infinitely closer to the psychological $1300 resistance level. There have been consistently higher highs and higher lows created on the monthly, weekly and daily charts. With the metal commencing 2019 on an extremely positive note and poised to challenge $1300, bulls remain in firm control. A solid breakout above $1300 is likely to open the gates towards $1350 and $1370. The weekly chart depicts a similar bullish picture with $1300 seen as a very significant point of interest. In regards to the daily charts, with prices clearly in an uptrend bulls remain protected above $1272. 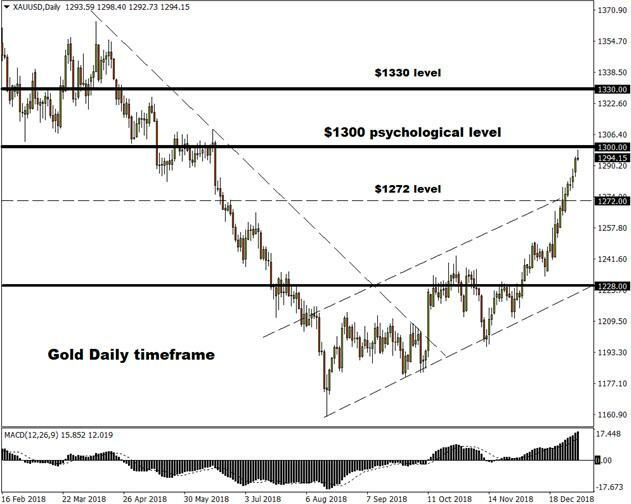 Alternatively, Gold still runs the risk of sinking back towards $1245 if $1300 proves to be a very stubborn resistance and global risk sentiment improves on easing trade tensions.